480 pages | 52 Color Illus. | 151 B/W Illus. The process of cryogelation has been vigorously studied over the past two decades, with recent research focussing on applications of these polymer systems in various biomedical and biotechnological fields. While there is significant literature available as research publications, limited reviews, and book chapters, Supermacroporous Cryogels: Biomedical and Biotechnological Applications is the first dedicated book on the subject. It thoroughly explores all aspects of cryogels from synthesis to applications in medical and biotechnological research and practice. Presenting the work of researchers from around the globe, this book addresses three key components of cryogelation, starting with an overview of the unique inherent properties of cryogels and their synthesis and optimization from various natural and synthetic polymers. It also focusses on the surface modification of cryogels as well as factors that affect their properties. The second component is a discussion of the biomedical aspects of cryogels, categorically describing their biocompatible nature and their recent usage in medical imaging by creating phantoms of various tissues and using tissue engineering to regenerate various tissues. The third reviews a wide range of applications of cryogels in biotechnology, including biocatalysis, cell separation, wastewater treatment, high throughput processes, and bioreactors. 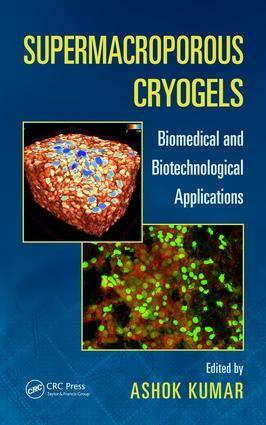 A comprehensive look at the process of cryogelation and an up-to-date account of significant developments in cryogel research, Supermacroporous Cryogels provides a single source of information beneficial to unacquainted readers as well as experts wanting to know about current research and practice regarding cryogels in medicine, technology, chemistry, and materials science and engineering. Ashok Kumar is a professor of bioengineering and holds the Lalit Mohan Kapoor endowed chair professorship in the Department of Biological Sciences and Bioengineering at the Indian Institute of Technology Kanpur. He earned his PhD in biotechnology from IIT Roorkee. He has carried out profound research on synthesis, properties, and disparate applications of cryogels and smart polymers. His research interests are in biomaterials, tissue engineering, stem cell technology, regenerative medicine, bioprocess engineering, bioseparations, and environmental biotechnology. He has published more than 125 peer-reviewed research articles, holds several patents, and has edited five books. He is an executive board member of the Asian Federation of Biotechnology and serves on the editorial board and expert committee of many reputable journals and scientific organizations. He has received several awards for his research contributions.